Chicken Parm Bake Recipe - We posted some recipes on chicken here is another recipe of chicken that is difference from the old recipes. Read what is new and do the best chicken recipe you are going to say wow. Here is what you'll need to cook Chicken Parm Bake to serve 8 peoples. Season both sides of chicken breasts with salt, pepper, garlic powder, onion powder, oregano, and basil. Sear in an oiled pan over high heat until the outside is brown and crisp, about 5 minutes per side. Transfer chicken to a cutting board and dice. 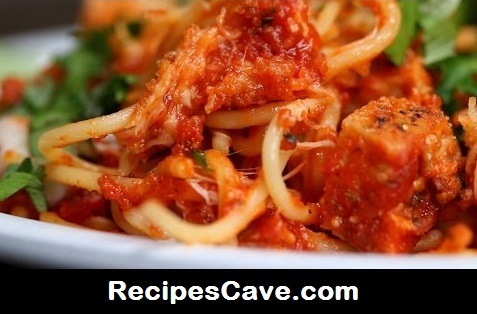 Place spaghetti in a greased 9x13 glass baking dish. Spread 2 cups of marinara over spaghetti. Layer on the chicken, remaining marinara, mozzarella, parmesan, and bread crumbs. Bake for 35 minutes. In a bowl, combine broccoli, oil, salt, and pepper. Place on a baking sheet, and bake 15 minutes. Your Chicken Parm Bake Recipe is ready to eat.